The expulsion of evil spirits by spells; in Greek ἐκβάλλειν (Matt. viii. 16, 31; ix. 34, 38; Mark i. 34, 38; ix. 38; Luke xiii. 32; and elsewhere). 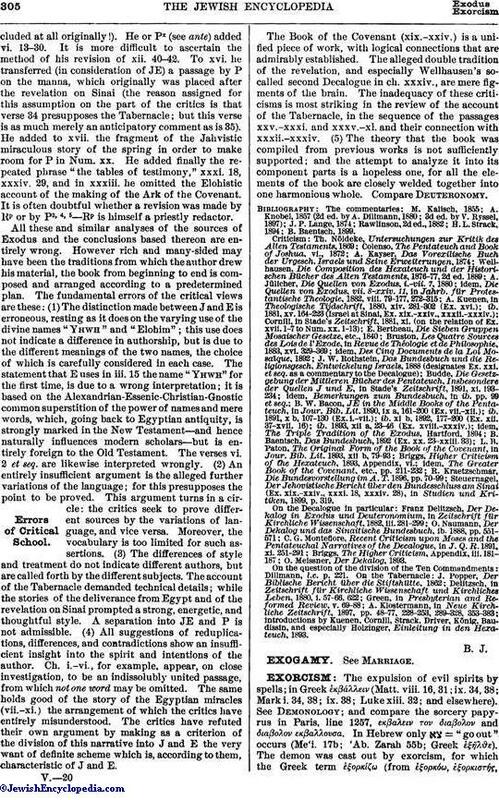 See Demonology; and compare the sorcery-papyrus in Paris, line 1257, εκβαλειν τον διαβολον and διαβολον εκβαλλονσα. In Hebrew only = "go out" occurs (Me'i. 17b; 'Ab. Zarah 55b; Greek ἐξῆλϑε). The demon was cast out by exorcism, for which the Greek term ἐξορκίςω (from ἐξορκόω, ἐξορκιστής,only Acts xix. 13) and the Hebrew are used. In the Bible the melancholia of King Saul is ascribed to an evil spirit, which David, by his harp-playing, drives away. The word "bi'et" (terrify) was still used in the fourth century of our era as a term to express the troubled state which precedes that of being possessed (I Sam. xvi. 14-23; compare Meg. 3a, bottom). The angel Raphael teaches Tobit how to ban the evil spirit (Tobit vi. 7, 16, 17; viii. 3; see Tobit and Testament of Solomon). "I have seen a certain man of my own country, whose name was Eleazar, releasing people that were demoniacal, in the presence of Vespasian and his sons and his captains and the whole multitude of his soldiers. The manner of the cure was this: He put a ring that had a root of one of those sorts mentioned by Solomon to the nostrils of the demoniac, after which he drew out the demon through his nostrils; and when the man fell down, immediately he abjured him to return into him no more, still making mention of Solomon, and reciting the incantations which he composed. And when Eleazar would persuade and demonstrate to the spectators that he had such a power, he set a little way off a cup or basin full of water, and commanded the demon, as he went out of the man, to overturn it, and thereby let the spectators know that he had left the man; and when this was done the skill and wisdom of Solomon were shown very manifestly." See Ba'aras. Rabbi Johanan ben Zakkai, a contemporary of Josephus, alludes to the practise of exorcism by saying: "Has an evil spirit never entered into you? Have you never seen a person into whom an evil spirit had entered? What should be done with one so affected? Take roots of herbs, burn them under him, and surround him with water, whereupon the spirit will flee" (Pesik., ed. Buber, 40a). R. Akiba (d. 132), in speaking of diseases, uses the technical terms of exorcism ('Ab. Zarah 55b). Simon ben Yoḥai drove out the demon Ben Temalion from the daughter of a Roman emperor (Me'i. 17b). According to the statements in the Talmud, cures by exorcism were especially common in Judæo-Christian circles. Mention is several times made of a certain Jacob of Sekanya (see Jacob the Gnostic), who desired to cure in the name of Jesus one who had been bitten by a snake; R. Ishmael, however, would not permit it, preferring rather to let his sister's son die (Tosef., Ḥul. ii. 22). Origen says ("Contra Celsum," iii. 24) that he saw people cured of dangerous diseases—of possession, madness, and other ills—simply by calling on the names of God and Jesus, and that otherwise neither men nor demons could cure them. Christianity has preserved this belief up to the present day, for exorcism still forms a part of the rite of baptism (Herzog-Hauck, "Real-Encyc." v. 695-700; Hastings, "Dict. Bible," i. 811 et seq. ; Winer, "B. R." i. 161-165; Acts xix. 13-16). An interesting recipe is given in a Greek papyrus (see Dietrich, "Abraxas," pp. 138 et seq.). In order to drive out a demon one must take an unripe olive, together with certain plants, and murmur some magic words over them, among the words used being ιαω, the Greek equivalent of the Hebraic Tetragrammaton. The exorcist says: "Go out ['demon'] from—." Thereupon a phylactery is made from a piece of tin and is hung from the neck of the one possessed. The exorcist places himself in front of the possessed one and begins as follows: "I conjure thee in the name of the God of the Hebrews, Jesus, Jahaia," etc. The spirit is then conjured by a god, whose epithets are taken chiefly from the Bible. A shorter but similar exorcism is found in the same papyrus (lines 1225 et seq.). 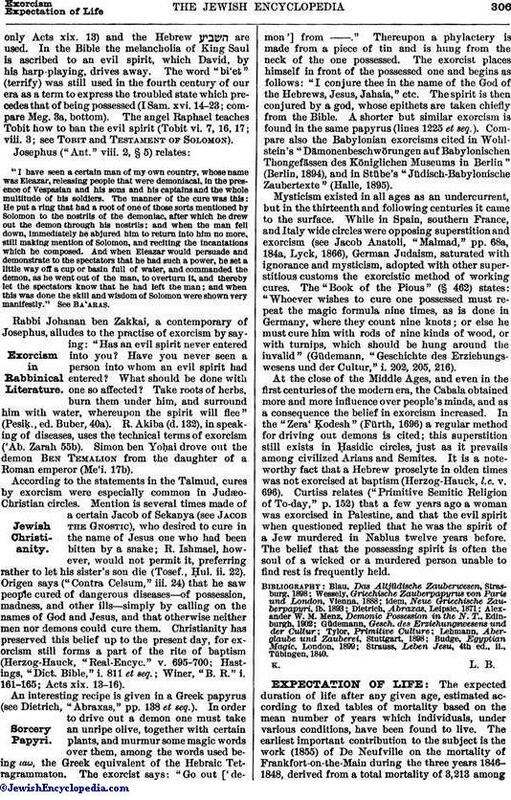 Compare also the Babylonian exorcisms cited in Wohlstein's "Dämonenbeschwörungen auf Babylonischen Thongefässen des Königlichen Museums in Berlin" (Berlin, 1894), and in Stübe's "Jüdisch-Babylonische Zaubertexte" (Halle, 1895). Mysticism existed in all ages as an undercurrent, but in the thirteenth and following centuries it came to the surface. While in Spain, southern France, and Italy wide circles were opposing superstition and exorcism (see Jacob Anatoli, "Malmad," pp. 68a, 184a, Lyck, 1866), German Judaism, saturated with ignorance and mysticism, adopted with other superstitious customs the exorcistic method of working cures. The "Book of the Pious" (§ 462) states: "Whoever wishes to cure one possessed must repeat the magic formula nine times, as is done in Germany, where they count nine knots; or else he must cure him with rods of nine kinds of wood, or with turnips, which should be hung around the invalid" (Güdemann, "Geschichte des Erziehungswesens und der Cultur," i. 202, 205, 216. At the close of the Middle Ages, and even in the first centuries of the modern era, the Cabala obtained more and more influence over people's minds, and as a consequence the belief in exorcism increased. In the "Zera' Kodesh" (Fürth, 1696) a regular method for driving out demons is cited; this superstition still exists in Ḥasidic circles, just as it prevails among civilized Arians and Semites. It is a noteworthy fact that a Hebrew proselyte in olden times was not exorcised at baptism (Herzog-Hauck, l.c. v. 696). Curtiss relates ("Primitive Semitic Religion of To-day," p. 152) that a few years ago a woman was exorcised in Palestine, and that the evil spirit when questioned replied that he was the spirit of a Jew murdered in Nablus twelve years before. The belief that the possessing spirit is often the soul of a wicked or a murdered person unable to find rest is frequently held. Strauss, Leben Jesu, 4th ed., ii., Tübingen, 1840.